All You Need is Love February Blog Hop with The Savvy 7 – Welcome! Welcome back to my blog! Today I am hopping with The Savvy 7 as a guest blogger. Our theme for February is All You Need is Love and I chose a classic white on white card featuring some great Fun Stampers Journey products. I like to create Valentine cards that can also be used for Weddings & Anniversaries. I used Whip Cream cardstock for this particular card but will often raise the elegance level by using our white Pearled Basics paper. This card features the I Heart Embossing Folder from the new Bloom This Way mini catalog. I just love the little hearts. I took our White Liner adhesive sheet & attached it to the Whip Cream cardstock to cut out the Decorative Hearts Die. I then peeled away the remaining adhesive backing & added Sparkle Cuts to the delicate die cut. I cut a separate solid heart from the die to back it with. The sentiment comes from Banner Sentiments. I masked off the word forever & stamped the Love in Clear Pigment ink, embossed with Silver embossing powder & diecut with an Ovals die. The background, heart & sentiment are all popped with Foam Squares to add dimension & interest. 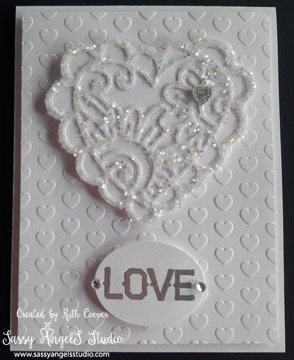 A couple of Rhinestones with a Sparkle Heart complete the card. It is much more dynamic & sparkly in person. Thank-you for visiting my blog today. Be sure to check out all The Savvy 7 projects. Absolutely stunning card! White on white is so elegant! Love your whole design! WOW… its stunning, Ruth! Love the white on white, the layout is perfect! What a pretty card! I love the white on white design and the sparkle! I love this sparkly white on white card and that it can be used for more than one occasion.